Plants are not the only things you will find at the Great Dixter Plant Fairs, held twice a year in the fields at the bottom of the magical garden in Northiam. 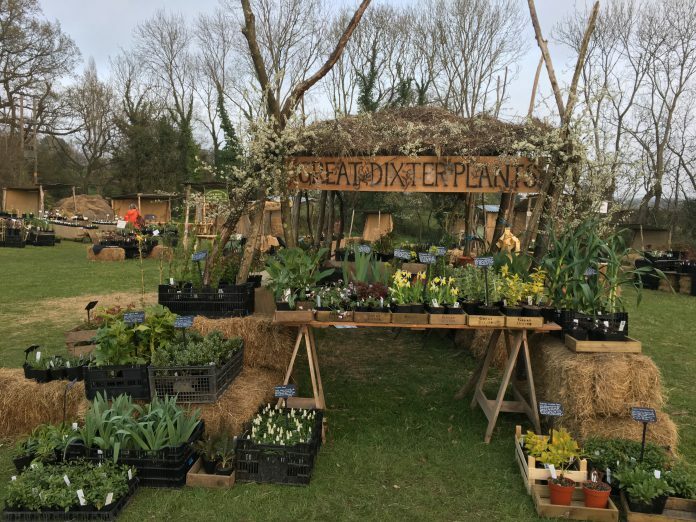 The spring plant fair was held over the weekend of April 6 and 7 and there will be another one on a date to be confirmed in the autumn. Over two thousand people came through the plant fair entrance to be greeted by an array of horticultural delights, spread across the fields. The loggia coffee shop, newly designed, was serving snacks and drinks and the incomparable cake stall was as busy as ever. With the barbecue going full blast, there was plenty of refreshment to help the weary plants person make their choices, and leave the site laden with their new and exciting tree, vine, shrub or herb, just waiting to be planted in the ground. But the fair did not only have plants. 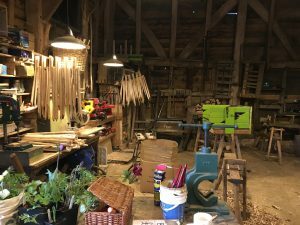 There were old tools to buy, cleaned and sharpened ready for action, pots and containers and Great Dixter’s carpenters had made benches, seats, hurdles and other woody things for the discerning purchaser. The Great Barn was open to show the woodwork shop and watercolour paintings were on sale, too. The fairs are always well supported, but the effects of Brexit on the nurserymen had been a bit of a worry, as many come from Europe and had said at the autumn fair in 2018 that they were not sure they would be able to come. However, Brexit chaos worked in Great Dixter’s favour, and more came than had been feared. So it was good to see them. If you want to see the house and gardens and find out what is happening, the only truly reliable website is that of the property. Everyone working at Dixter, staff, volunteers and well wishers is looking forward to the next plant fair and all the other study days and activities, including lots for very small people under school age. We look forward to seeing you!